Four years ago I was introduced to a whole new world that I never even knew existed! I started taking a Meditation class and learned all about quieting my mind and letting it go. It was wonderful and I always felt so good after th0se classes. I then started getting Reiki sessions to help me with my chronic pain. I found them very helpful as well and I began to read more on the subjects of healing, crystals and of course, the chakras! I began my crystal collection and learned what each one represented and how to properly care for them. I also started taking Reiki classes and am now a Level 3 Reiki. One thing I love to wear is my crystal jewelry. I was so excited to find Shanti Boutique online and was drawn in to their wonderfully beautiful jewelry. They carry chakra jewelry, yoga jewelry, meditation jewelry, etc and I wanted one of everything! If you have event the slightest inkling of interest in the metaphysical, then you will love this store. When my Well-being 7 Chakra Necklace arrived, I immediately fell in love. It was everything I had imagined a chakra necklace to be and more! It has the stones to represent the seven chakras: amethyst (crown), iolite (third eye), apatite (throat), peridot (heart), citrine (solar plexus), carnelian (sacral) and garnet (root). If you don’t know what a chakra is, let me fill you in. Chakras are invisible energy centres in our body and each one is a different colour and has a different function. 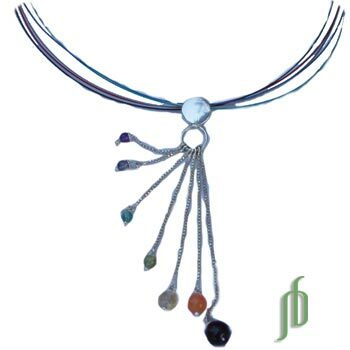 The necklace is made from sterling silver and each chakra stone is hung on its own little silver strand of varying lengths to represent its location on the body. Not only is this is this necklace stylish and pretty, but its also meaningful. I love the hidden meanings of the chakra and find myself touching the stones throughout the day. Even if you don’t much about the chakras, you can still wear this necklace with its vibrant colours. I would like to get a pair of the Well-being 7 Chakra Earrings and the Well-being 7 Chakra Ring to fully complete the look. Buy the Well Being 7 Chakra Necklace for $58 at Shanti Boutique and check out their rest of the jewelry while you are there! WOW these are so beautiful! I really need to get one of these. 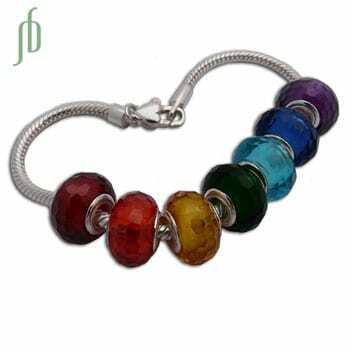 I love the Faceted Chakra Bead Bracelet.